I just got this great dough scraper from Sunsella. I love to cook and I spend a ton of time in the kitchen. One of my favorite tools is this pastry scraper. I love the nice rubber handle because it makes it comfortable to use and handle. It has a ruler on the end of it so for pastry baking it’s really convenient to have it as a measuring tool. The stainless steel holds up really nice and is very sturdy when using. I often use this for a lot of different purposes. You can cut with it when making dough and pastries. You can measure with it. I also use it as a food carrying device. I will scrap up all the food and then carry it over to the pan, makes it so quick and easy. No messes that way. It’s dishwasher safe, so when I’m done using it I just throw it in the dishwasher to clean. One of my favorite cooking tools and a must have for every chef!! This pastry scraper and chopper is extremely tough and durable. High-grade stainless steel with a super comfortable, hardwearing, non-slip, ergonomic rubber handle. Sturdy engineered blade that wont tarnish over time. 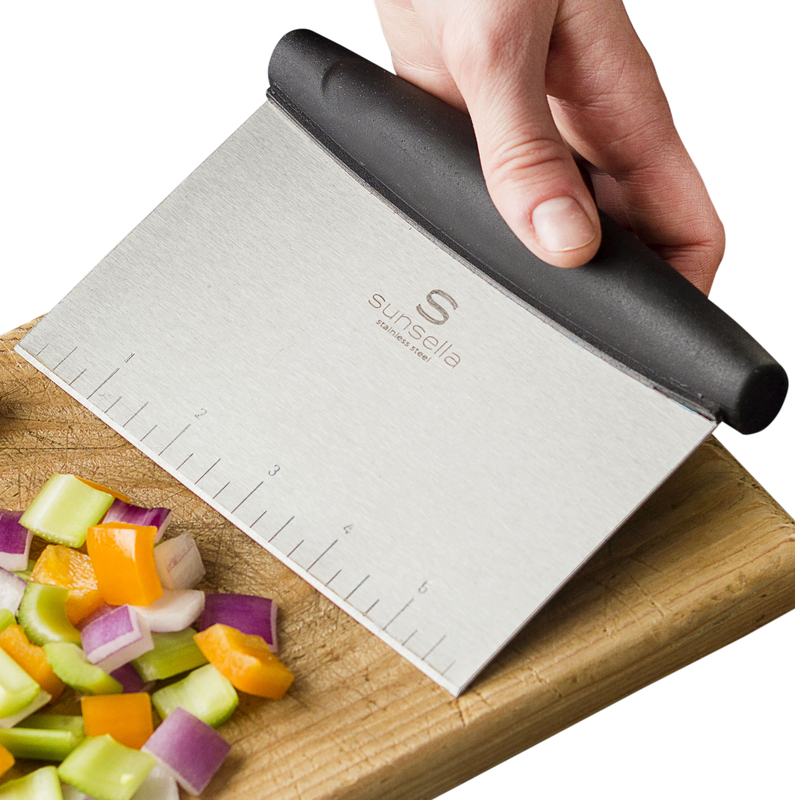 Machined edge for slicing and dicing with ease. Rounded corners that wont dig into your cutting board or bench top. Great for baking prep and pastry making. Chop and slice vegetables or meat and use the large blade to transfer straight to the pot with one scoop. Also handy as a BBQ grill tool. Measurements are pressed into the steel blade so wont wear off over time. Dishwasher safe for easy cleanup. Dimensions: 6 inches x 4.3 inches. You can purchase this scraper on Amazon!